Just don't forget the goggles and scarf. Creator of JennyEverywhereDay.com, Benj Christensen, says, "Jenny Everywhere has an organically grown mythology. Creators can take elements of previous works that inspire them and add their own twists and sensibilities which can then inspire someone else. Unlike characters that are beholden to a copyright and a status quo, Jenny is free to become a true amalgam of ideas. The open source license allows the kind of legal freedom characters like Sherlock Holmes and Robin Hood have thrived in. But, Jenny is still in her creative infancy; her core mythology is still mostly unwritten, and, to me, that’s what's most exciting." According to Steven "Moriarty" Wintle—a comic artist from Ottawa, Ontario—Jenny Everywhere is the first "open source comic character." Wintle created the character in conjunction with the Barbelith Underground community in 2002. Barbelith, an online forum named after an element in the comic book series The Invisibles by Grant Morrison, was initially conceived of as a place for discussion of Morrison’s works. The community has seen little action since 2012. Jenny is described as "existing in every reality and being able to shift between realities." Jenny Everywhere is also referred to as "The Shifter" and was created, according to Wintle, because there were no truly open source or public domain characters. This enables artists and writers to place the character into just about any medium they choose. On Wikipedia: "She has short, dark hair. She usually wears aviation goggles on top of her head and a scarf around her neck. Otherwise, she dresses in comfortable clothes. She is average size and has a good body image. She has loads of confidence and charisma. She appears to be Asian or Native American. She has a ready smile." There's even a special day for people to send in their drawings and version of Jenny Everywhere every year on August 13. 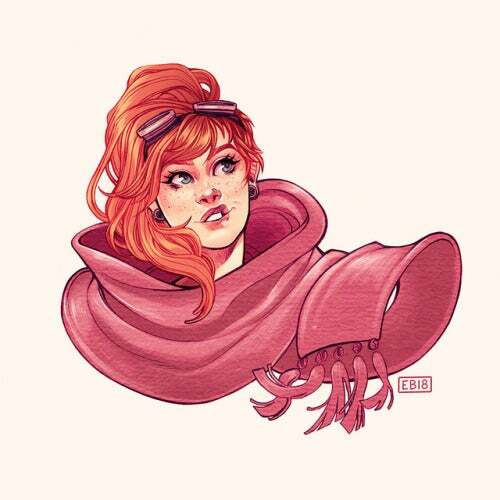 At Jennyeverywhereday.com, creators post their iterations of Jenny, and some have posted for years, like Elizabeth Beals, a fan from Georgia, who features her as a fiery redhead in a large red scarf. "I found out about Jenny by luck, the creator of the Jenny Everywhere Day website contacted me in 2011 to ask if I'd contribute a piece for Jenny Everywhere day. I loved the idea of an open source character who only had a few keystone features, leaving the rest up to the artists' imagination. Since then, I’ve contributed a piece every year, making little tweaks to my interpretation of Jenny as I go. (I've already got something in mind for next year. )," says Beals. There are drawing submissions, comic book submissions, and even a YouTube episode, "Mitigating Circumstances," which features Francesca Aquilina as Jenny, in a Seventh Seal-esque short that purports to deal with the everyday issues of Jenny Everywhere's time as a student. See more versions of Jenny. Jenny has only two mandatory attributes: aviator goggles and a large scarf. Other than that, Jenny can be of any race, age, or even gender. I decided that I would like to add to the Jenny Everywhere compendium of alternative relatives. I downloaded a public domain image to use as base art and the public domain image of the original Jenny Everywhere drawing from Wikipedia. I merged the two images using GIMP and Inkscape on my Ubuntu laptop and exported the final artwork as a JPG. The creators of the character insist that any work involving her must include the following text: "The character of Jenny Everywhere is available for use by anyone, with only one condition: This paragraph must be included in any publication involving Jenny Everywhere, that others might use this property as they wish. All rights reversed." 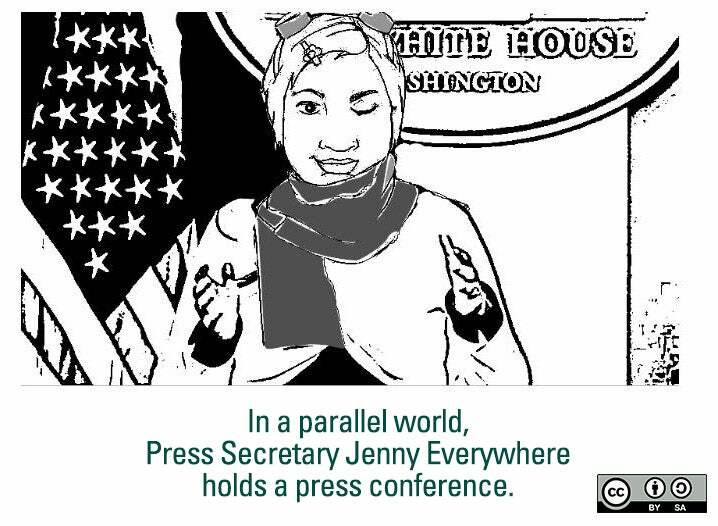 Whether or not you consider Jenny the embodiment of open source, Wintle and crew have given the world a unique character, which others can use and modify as they wish in true open source spirit. In a previous article, I wrote about the open source nature of Star Trek. For years, people have adapted the characters and universe of Star Trek and created their own web series for public use, such as Star Trek Continues. In 2015, CBS decided that it would no longer allow fans to produce “feature-length” productions adapted from Star Trek in what has become, as I call it, the “Axanar Decision,” based on a lawsuit between CBS and the creators of the “Prelude to Axanar” Star Trek-based web-series. CBS has the right to deny the open sourcing of the Star Trek universe, as unfortunate as this decision is. But at least Steve Wintle has given us Jenny Everywhere, whom we, in the open source community, can adapt and use as we wish, sharing with the greater community to build upon the theme and the character and creating a larger, more robust universe for our brave, intrepid heroine. Jenny Everywhere is able "to boldly go where no animated character has gone... before." We wish her Godspeed in her future endeavors. I absolutely love this idea. Thanks for raising awareness of it.